New process makes the production of pharmaceuticals more efficient and sustainable. In the near future, fossil raw materials can be replaced in the production of two important anticancer drugs. An interuniversity team with researchers from UAntwerp and KU Leuven developed a process that starts from … wood. 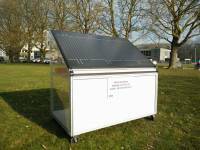 Bioscience engineers at KU Leuven have created a solar panel that produces hydrogen gas from moisture in the air. Companies are keen to use miniature chemical reactors to make pharmaceuticals and fine chemicals, but are discouraged by their tendency to clog up. Researchers at KU Leuven have now devised an elegant way of using sound waves to keep the chemicals flowing. How did bioscience engineers at KU Leuven manage to convert water vapour directly into hydrogen gas, with record efficiency? 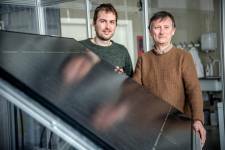 And does their hydrogen panel signal the end of fossil fuels' We asked Johan Martens and Tom Bosserez from the Centre for Surface Chemistry and Catalysis for the answers. On 1 December, a team of glaciologists and climate researchers from ULB , UCLouvain and the University of Colorado will head for the Antarctic. On the agenda is the second field campaign for the Mass2Ant project being coordinated by UCLouvain , which also includes partners from the IRM (the Royal Meteorological Institute of Belgium) and Delft University of Technology. Currently 50 jobs in fields Chemistry, Computer Science/Telecom, Earth Sciences, Environmental Sciences, Mathematics, Physics / Astronomy.